Department of Computer Science and Engineering, Indian School of Mines, Dhanbad, India. 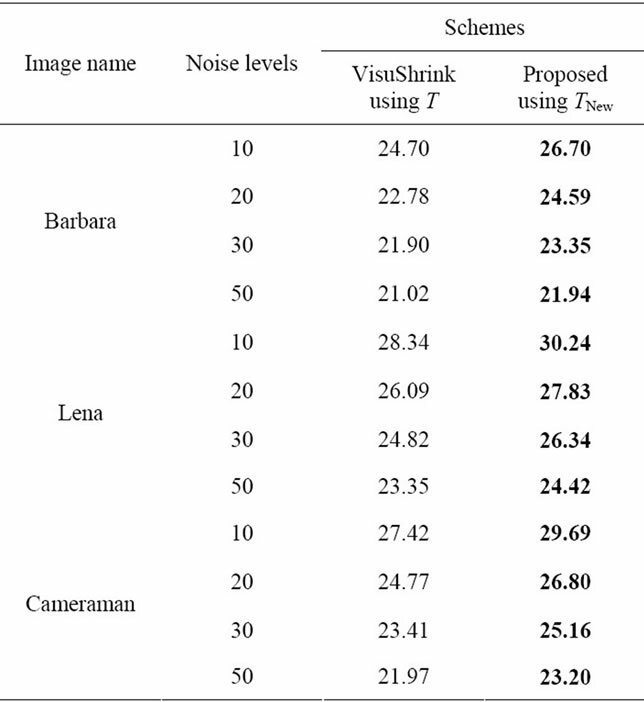 One of the main tasks of image processing is to distinguish between noise and actual contents so that the unwanted noise from the image signal can be removed. The distortion of an image by noise is very common that gets introduced during its acquisition, processing, compression, transmission, and reproduction. The noise is generally assumed to be additive white Gaussian noise. Several techniques using wavelet-based thresholding have been discussed in literature to reduce the noise from an image [1-4]. Donoho has proposed VisuShrink using hard and soft thresholding methods for image denoising [5-7]. This scheme exterminates many wavelet coefficients that might contain useful image information. However, the major problem with both these methods is the selection of a suitable threshold value . In this paper, we discuss a new image denoising scheme that performs better than the VisuShrink. The rest of the paper is organized as follows. The soft-thresholding method is discussed in Section 2. Section 3 discusses the proposed work and Section 4 discusses the results. In our experiments, we take three commonly used images in literature to establish the efficacy of our proposed method. Finally, the paper is concluded in Section 5. Consider an image signal fij of size M × M. Assume that it is corrupted by independent and identically distributed (i.i.d) zero mean, white Gaussian noise zij with standard deviation σ. The corrupted image, denoted by yij, is given as follows. where dij = W yij, cij = W fij, and εij = W zij, i, j = 1, 2, ···, M.
Here the estimate is derived from the noisy image y by first applying wavelet transform on it, followed by thresholding, and then taking inverse wavelet transform of the resultant. We will use soft thresholding in this paper that is defined as follows. Using soft thresholding we will try to remove the noise from the image. The proposed algorithm is discussed in next section. 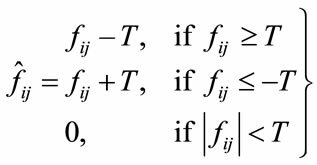 In our proposed scheme first we determine the threshold value and then apply it on the wavelet coefficients of the image. First we discuss the thresholding function that will be used in our method followed by denoising method. where , here k = 1, 2, ···, J; where J represents the number of decomposition levels which is prespecified and M represents the size of original image and σ2 is noise variance. 1) Perform multiscale decomposition on the image corrupted by Gaussian noise. The 2-D orthogonal wavelet transform W on a noisy image y is performed up to Jth level to generate several subbands. For each level, compute TNew as a threshold using (5). 2) For each subband (except the low pass residual), apply TNew and then use the Soft-thresholding method to the noisy coefficients to get the noiseless wavelet coefficients. 3) Finally take inverse wavelet transform of the resultant image obtained in step 2) in order to obtain the denoised image . Figure 1. Original test images of size 512 × 512 pixels: (a) Barbara; (b) Lena; (c) Cameraman. Table 1. 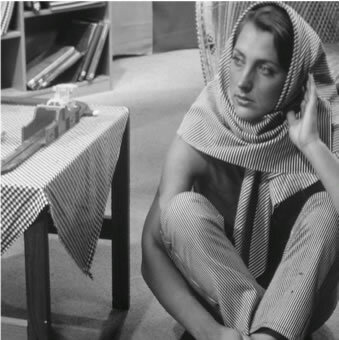 Denoising numerical results (PSNR in db) for Barbra, Lena and cameraman images. Figure 2. Barbara image with (a) Original; (b) Noisy image with noise level 10; (c) Denoising using visushrink; (d) Denoising using proposed scheme. nature of results, we have shown the images for noise level 10 only. Figure 3. 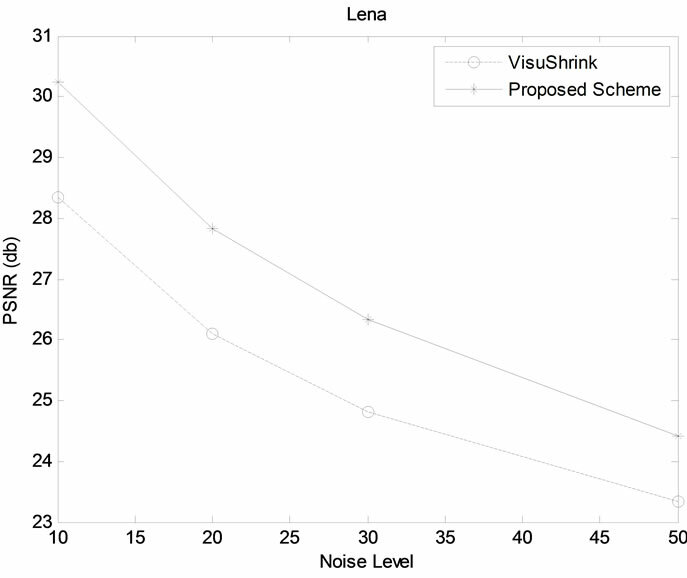 PSNR gain vs. noise level of Proposed and VisuShrink methods: (a) Barbara; (b) Lena; (c) Cameraman. images. It is evident from these figures that our scheme performs much better than the VisuShrink scheme for all three images. As mentioned above, we have shown images for noise level 10 only; but our scheme performs much better for other noise values. Thus, we have shown that our scheme performs much better than the VisuShrink scheme, i.e., it removes the noise from the image significantly. We have not shown the images for other two images, i.e., Barbara and Goldhill because of repetitive nature of results. 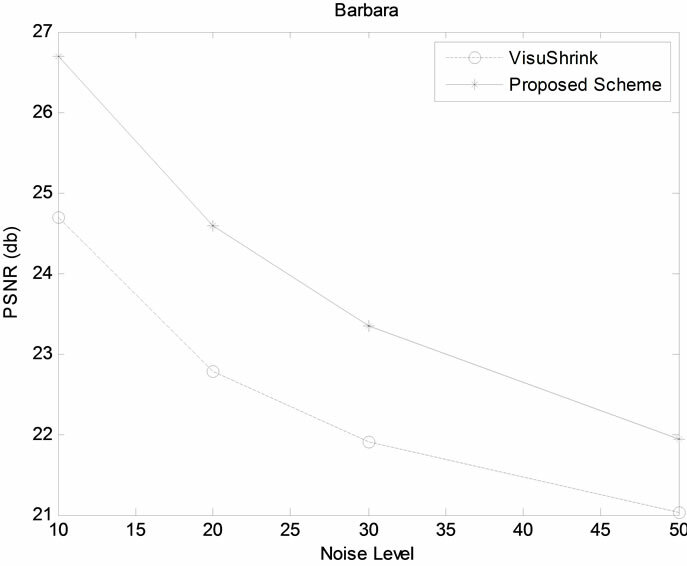 In this paper, we have proposed a new soft-thresholding scheme that removes the noise significantly and performs the VisuShrink in terms of PSNR for all value all values of noise level. The authors express their sincere thanks to Prof. S. Chand for his invaluable comments and suggestions. M. Jansen, “Noise Reduction by Wavelet Thresholding,” Springer Verlag Inc., New York, 2001. 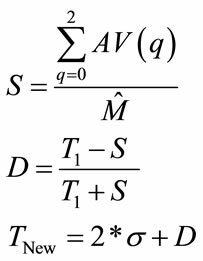 D. L. Donoho and I. M. Johnstone, “Wavelet Shrinkage: Asymptotic?” Journal of the Royal Statistical Society, Series B (Methodological), Vol. 57, No. 2, 1995, pp. 301- 369. C. S. Burrus, R. A. Gopinath and H. Guo, “Introduction to Wavelet and Wavelet Transforms: A Primer,” Prentice Hall, Upper Saddle River, 1998. 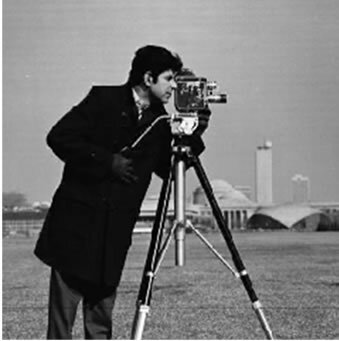 H. Om and M. Biswas, “An Enhanced Image Denoising Scheme,” International Journal of Advanced Computer Engineering, Review, 2012. H. Q. Li and S. Q. Wang, “A New Image Denoising Method Using Wavelet Transform,” International Forum on Information Technology and Applications, Chengdu, 15-17 May 2009, pp. 111-114. S. Gupta and L. Kaur, “Wavelet Based Image Compression using Daubechies Filters,” Proceeding of 8th National Conference on Communications, I.I.T., Bombay NCC, 2002. I. Daubechies, “Ten Lectures on Wavelets,” Proceeding of CBMS-NSF Regional Conference Series in Applied Mathematics, SIAM, Philadelphia, 1992.